This post has 6,994 views. 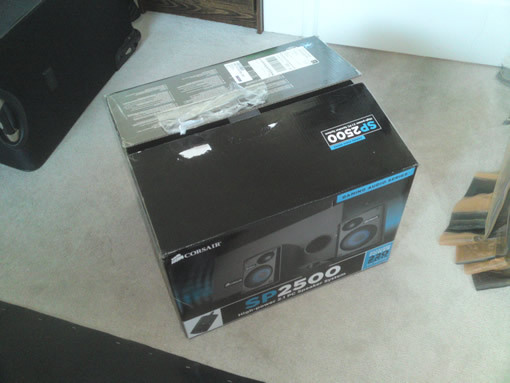 For a 2.1 system, the SP2500 came in a surprisingly large and hefty box. It’s certainly not your average 2.1 computer speakers. The box has a black and blue color scheme and features a nice picture of the speaker set along with the specs and other notices. The insides of the box were packed very nicely. 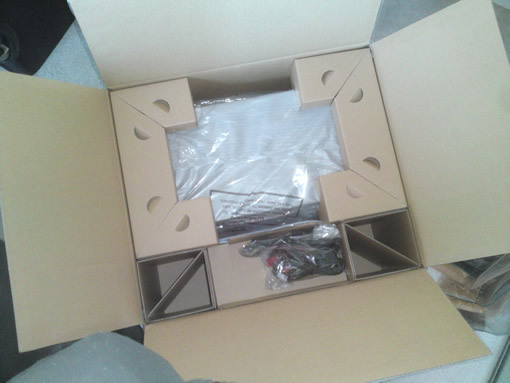 Inside the box, everything is neatly packaged and sectioned off with cardboard blocks. They probably did it this way to make the speaker easier to repackage. Too bad I had to get rid of the box to fit the speakers into my luggage. The manuals and readings, none of which I bothered to read. The whole SP2500 package includes the two satellites, the subwoofer, the control pod, a manual, and all the audio cords and power cables needed to make the speakers work. The two satellites are normal sized (by computer speaker standards) and they share the black and blue color scheme of the box. The satellites come with little standoffs that allows you to point them slightly upwards or downwards. Since I’m placing the speakers on the floor, I tilted them upwards. For a 2.1 PC set, the SP2500's subwoofer is massive. In comparison to the satellites, the subwoofer is massive and hefty. 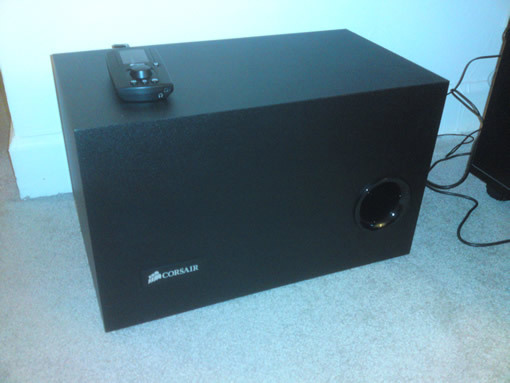 The subwoofer is all black and has a panel of ports for all the connections on its back. All of the other parts of the speaker set plug into the back of the subwoofer. The setup was so easy that I didn’t need to look at the manual. To shake the entire apartment, turn dial all the way clockwise. 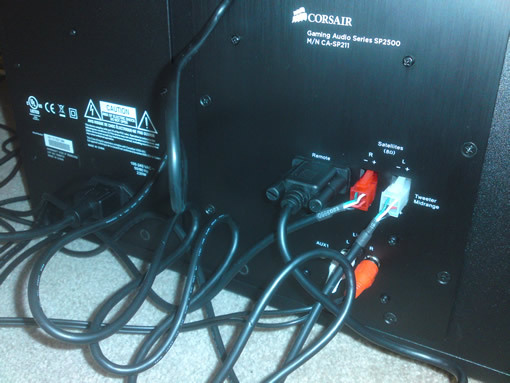 The SP2500 is adjusted with the included control pod which connects to the subwoofer with what looks like a serial cable. The control pod features a small LCD screen, a scrolling button, the power button, and three other buttons to control the speaker set. Using the buttons and the screen, the user can adjust the volumes of the satellites and subwoofer (separately), adjust the input sources, and use any number of audio presets. The SP2500 has three inputs: red and white RCA connectors and an auxiliary (3.5mm TRS) jack on the back panel and an additional auxiliary jack on the control pod. The control pod also has 3.5mm headphone jack and a micro-USB connector for firmware upgrades. 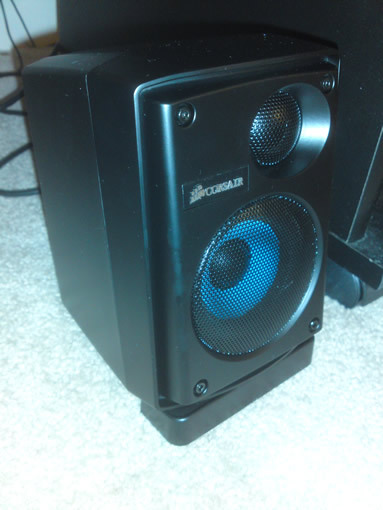 The SP2500 speakers set looks pretty nice and build quality seems solid. To test that the speakers work after I had connected them to the TV, I just turned on the TV to some random channel. 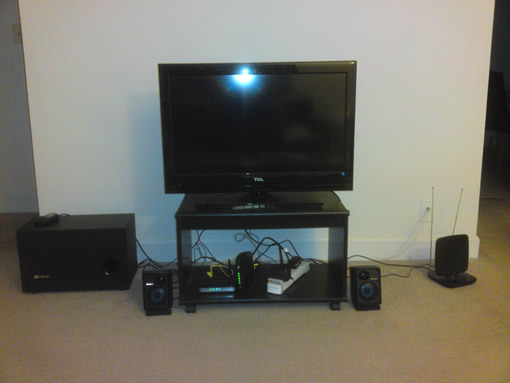 Obviously there was no comparison between the TV’s tiny little speakers and the SP2500’s 232 Watts of power. The SP2500 sounds better, richer and louder by a wide margin. I’m no audiophile, and I don’t have another set to compare with, but the SP2500 sounded pretty nice to me. I didn’t turn the volume all the way up because I didn’t want to disturb the neighbors, but most reviews I’ve read said that the speakers can maintain sound quality even when cranked up to the max, and the big subwoofer produces pumping bass. 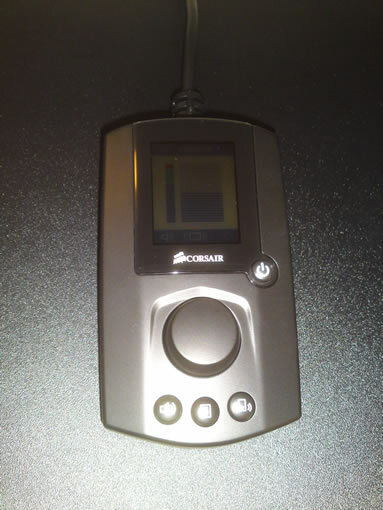 Overall, the Corsair SP2500 has given me some good first impressions. It’s not a 5.1 or 7.1 surround sound speakers that real home theater buffs would use, but it’s definitely a big improvement over the TV’s internal speakers. Best of all, I got the set for free, and that’s probably the best part of the story. 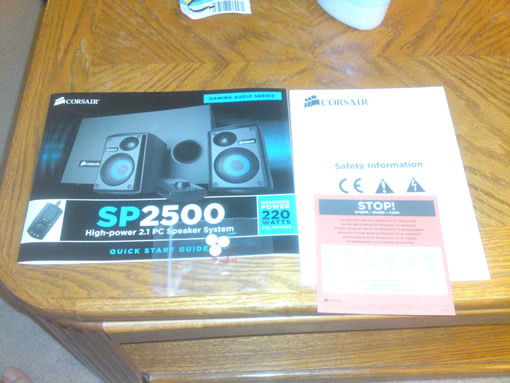 I watched a movie on the TV and the SP2500 speaker set, and I was pretty pleased with the results. All the scenes with loud sounds and explosions had some kick to it thanks to the speakers. This might be more motivation for me to watch movies with the TV more often now.